A heat gun is a device shaped much like a hair dryer that blasts highly heated air from the front. It can be used in many applications around the home--such as: stripping paint, removing old wallpaper, removing old caulk, and bending or shrink-fitting plastic tubing. Due to extremely high heat, these tools must be used with great care. A heat gun is designed to super-heat air up to temperatures of 1,200 degrees F. The highest temperatures are available on professional models; types designed for home use don't get as hot. The hot air blasting from the nozzle end of the device melts or dissolves materials, facilitating their removal. Heat guns can be used on paint, caulk, adhesives and plastics. Heat guns come in a variety of sizes and strengths, but all have an electric power cord, a handle to grip, and a nozzle or air opening on the end of a cylindrical tube. Many have triggers on the handle to blast air or stop the air flow as you use the heat gun. Some come with stands to set the tool on your workbench, and others have multiple attachments for the nozzle to further condense or direct the heat. When using a heat gun to remove paint, the application of the super-heated air will cause the paint to bubble and melt. This can easily be scraped off with a putty knife or similar tool. Adhesive and caulk is affected in much the same way; it will melt or become pliable and can be scraped away. You can also use a heat gun to attach plastic pipes together or shrink-fit tubing. The heat will melt special plastic solder into the joints and will also cause melting and shrinking of thinner, flexible plastic. Using a heat gun to strip old paint, wallpaper, adhesives or caulking can greatly speed up the process of remodeling a room or refinishing a piece of furniture. Instead of spending hours scraping and scrubbing or using chemical solvents that can be damaging, a heat gun simplifies the process. Heat guns create very high heats that can easily burn skin. Heat-resistant gloves should be used at all times. Be aware that the heat can also damage or burn materials you work on. It's a good idea to have a fire extinguisher nearby. 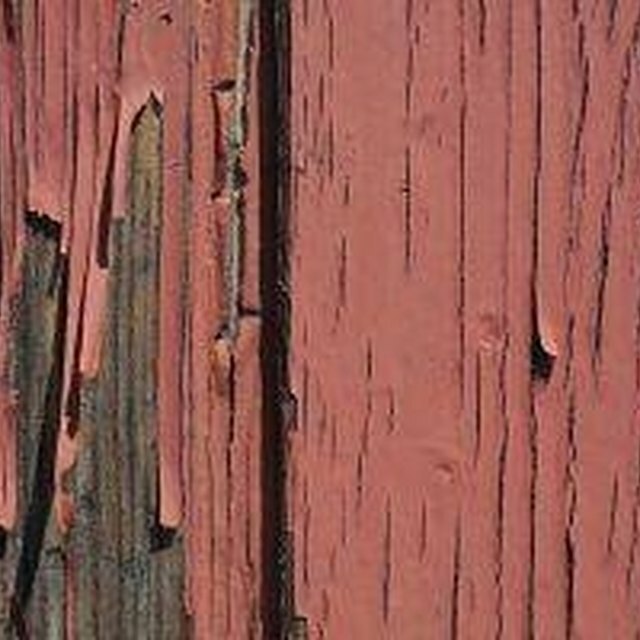 Stripping paint, adhesives and caulking can result in noxious or toxic fumes. Sufficient ventilation and a breathing mask are recommended whenever a heat gun is used. What Is a Residential Heat Exchanger?